Browse the current Arby’s Coupons & Online Promo Codes. Find the Arby’s Promo Codes & Coupon offers and save money when you use printable coupons and discounts to buy sandwiches – Roast Beef Gyro, Turkey Gyro, Traditional Greek Gyro, Crispy Fish, Cajun Fish plus salads, sides, desserts & drinks. Arby’s is a casual dining restaurant where you can find cheap eats every hour of the day and limited-time offers for burgers, drinks and other popular menu items. Arby’s Smoked Brisket sandwich LTO was one of the restaurant’s best selling foods last year and they’re always making it a surprise with secret menu items that you can ask for when they aren’t technically on the menu. Here are some hacks for eating cheaper at Arby’s. 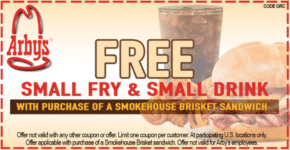 Get free small fries and a small drink at Arby’s with a printable coupon during special promotions when you purchase a specified menu item. Receive 10% off your order if you’re a senior at participating locations. Take advantage of the Mix & Match offers that include classic menu items at great prices. Look for Arby’s limited time offers on the website and check back often for new deals. Sign up for Arby’s email list and get a coupon offer for your next visit.